Like many ancient parish churches, St Stephen Parish Church has been subject to many repairs and restorations throughout the centuries. Dedicated on 20th August 1261 by Bishop Bronescombe of Exeter, its patron is unknown, but the bishop recorded in his register that he had just dedicated ‘the church of St Stephen juxta Hyndemore’, the church near the moor which extends to what is now known as Hensbarrow. It is likely that this is not the first church in St Stephen, indicated by the ancient crosses in the churchyard by the south door, and by the name of the nearby farm, Egloshellens, suggesting an earlier church; according to some dedicated to St Elent, by others to St Helen. Opposite the crosses is a reading stone, where the priest would give out the news after the Sunday service. The very oldest visible parts of the church are the south door and the Norman font, dated by historians as between 1150-1180. 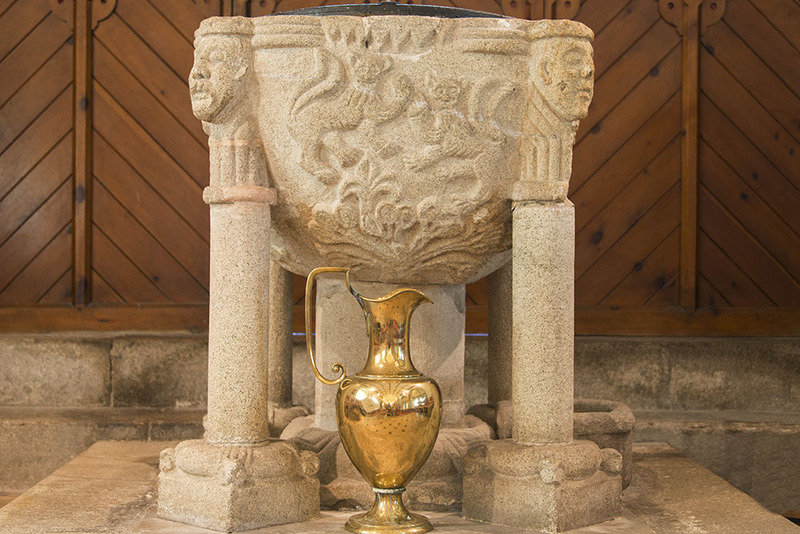 Originally sited inside the door, it now stands in an imposing and elevated position at the west end of the church, and the bowl is one of the best of its type, carved with exotic beasts, lilies, and corner heads with crowns. Evidence can also be seen of where 13C fixings were used to fasten the cover on the font to prevent people from stealing the holy water. The 39”thick walls on the south side of the church indicate that the ancient walls are now found within a more modern exterior, but on the Norman doorway you can still see the stone ‘nail heads’, an unusual feature giving the impression that a nail was driven through the stone. The latest part of the church is the unfinished Tudor south aisle, faced with granite ashlar. Only the north aisle retains its late medieval roof. The three parishes of St Stephen-in-Brannel, St Michael Caerhays and St Dennis constituted a united rectory and vicarage until 1852, when the three livings were made into three separate rectories. St Stephen was originally the ‘mother’church, the others being regarded as chapels to it. In the sixteenth century according to Henderson it became usual for the rectory and vicarage to be held together and the preference of the incumbents for residence at Caerhays brought about the notion that Caerhays was the mother church. For some time the parishioners of St Dennis paid the Mother Church on each St Stephen’s day one pound of beeswax and one black sheep. The tower was struck by lightning in 1784, and by the time Revd A R Taylor was appointed in 1852 the church was in a very bad state. Successive Rural Deans in the early 19th century reported that the end chancel wall ‘was out of perpendicular’, the roof was out of repair, and suggested that the floor ‘of common soil’should be laid with stones. Delaying the building of a Rectory here, Taylor was determined to make God’s house watertight, and a major restoration was undertaken in 1854. Also elevated, the High Altar is in Taylor’s memory. Something that didn’t survive this was a fresco painting depicting the martyrdom of a mitred figure with a rope around his neck who was laid out on a tomb or altar, surrounded by others, including another bearing a mitre, holding their hands in the attitude of lamentation. Major work was again undertaken in the late 19th and early 20th Centuries, which included the removal of pews and screen, work to the bells, moving of the organ and vestry, providing heating, works to the ceiling, roof and walls – an almost complete restoration for less than £2,000. Additions of particular note over the years are the stained glass windows to the east end of the church – one depicting the stoning of St Stephen, in memory of Canon F F Gilbert, and behind the High Altar a memorial to those who lost their lives in World War II, showing the two principal industries of the parish, farming and clay mining, around a central panel showing the Last Supper, together with emblems of the armed forces.